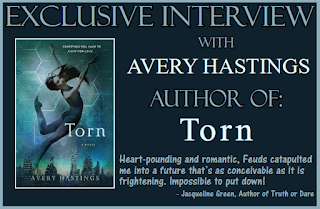 TORN is the second novel in the Feuds series, and we're excited to have Avery Hastings here tell us more about it. Avery, what scene was really hard for you to write and why, and is that the one of which you are most proud? Or is there another scene you particularly love? When Davis finally encounters her mother, it’s a very tense and emotional moment. She’s longed for her mother for years—and when she sees her, it’s a horrible disappointment, but it also offers closure. It was really tough to write that scene given that Davis had to cycle through shock, horror, crushing disappointment, and sadness. But I also love that scene because it brings Davis to a stronger, clearer place. She never felt like she measured up to her mother’s legacy as a ballerina—but seeing her mother for who she is allows her to appreciate the parts of her that are nothing like her mother. She can move out from under her mother’s shadow, and stop reaching for something unattainable. I don’t think it’s ever easy, except maybe for a few charmed souls. I wrote one novel that went unpublished, prior to my first published novel. But I was very lucky in that the unpublished novel secured me agent representation. In between published novels, I have written at least three that were rejected and have gone unpublished. But I do like to think those three novels were great practice—my prose is stronger now, and I’m a better plotter. When I was writing TORN I was a freelancer, and I often spent my afternoons in coffee shops. However, I have an adorable dog at home who misses me when I’m away—so I got into a routine of making coffee and breakfast at home around 8am, and writing in bed in my pjs for a while with him snuggled next to me. Then sometimes I’d take a break to work out, and move on to lunch and writing in a coffee shop. If I could ever wrangle a writing buddy to join me, even better! These days I write mostly on the weekends, and often with friends. It’s a great way to feel like you’re not being antisocial! And after a long, hard week it’s nice to make “writing dates” whenever possible. Writing can be isolating, and I like to avoid that. Unfortunately I can’t listen to music while I work, because I find myself wanting to hear the lyrics, and then I can’t write a thing. AVERY HASTINGS is an author and former book editor from New York City. She grew up in Ohio, graduated in 2006 from the University of Notre Dame and earned her MFA from the New School in 2008. 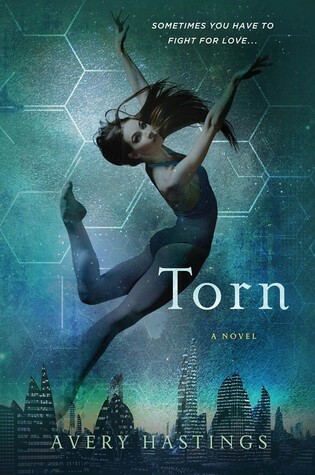 When she's not reading or writing, Avery can usually be spotted lying around in the park with her affable dog, and like her protagonists in Feuds and Torn, she knows how to throw a powerful right hook and once dreamed of becoming a ballerina. In addition to New York, Avery has recently lived in Mumbai and Paris, but is happy to call Brooklyn home (for now). What did you think of our interview with Avery Hastings, author of TORN? Let us know in the comments! Such a great interview. TORN sounds so good.